George Raymond Beck, age 96 years, a lifelong Frenchtown NJ resident, died Sunday, October 28, 2018, at Whitehall Manor in Whitehall PA.
Born June 10, 1922, in Frenchtown, George was the son of the late Arthur D. and Anna J. (Ashcroft) Beck. 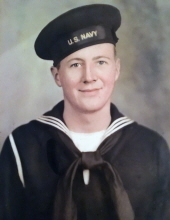 He received a Bronze Star while proudly serving in the United States Navy in World War II aboard PT Boats in the Pacific Theater, where he was a cook. George worked for Frenchtown Porcelain as a Kiln Fireman helping to make porcelain spark plugs, body armor, and other industrial porcelain components. After retirement, he worked part-time for Arvid N Myhre Building Construction Co. doing odd-jobs and running errands. Many will remember George as the original Frenchtown recycling coordinator in the 1940’s, picking up various recycling items for processing. George was the Frenchtown Man-Of-The-Year in 2004. George enjoyed keeping a vegetable garden and boating (including owning an airboat at one time). He was known for setting out a flower boat during Memorial Day festivities along the Delaware River in Frenchtown. He always looked forward to the many reunions of his fellow PT Boat shipmates throughout the years. In addition to his parents, George was predeceased by his brothers, Harvey Beck in 1941, and Clarence Beck in 1983, as well as his great-grandson, Scott Beck in 2016. He is survived by his wife of more than 70 years, Elsie (Weaver) Beck, his son and daughter-in-law, Teddy G. and Sharon Beck of Milford NJ, his sister, Esther Sine of Florida, his two grandsons and their spouses, Chris and Willow Beck of Easton PA, Kevin and Justina Beck of Catasauqua PA, his two step-granddaughters, Sherri and Art Gotthardt of Orlando FL, and Tamara Walton and her partner, Greg, of Worthington MO, as well as his four great-grandchildren, Matthew and Jadalyn Beck and Elisabeth and Abigail Walton. Memorial services, officiated by the Rev. Christopher Voorhees, will be at 11:00 am on Friday, November 2, 2018, at Holcombe-Fisher Funeral Home, 147 Main Street, Flemington NJ. Interment will follow at Frenchtown Cemetery. Calling hour will be Friday from 10:00 am until the time of service at the funeral home. "Email Address" would like to share the life celebration of George Raymond Beck. Click on the "link" to go to share a favorite memory or leave a condolence message for the family.